I know that Wednesdays are supposed to be for works in progress, but I have three, yes, three finishes to share. The first is my Echino rhino messenger bag! 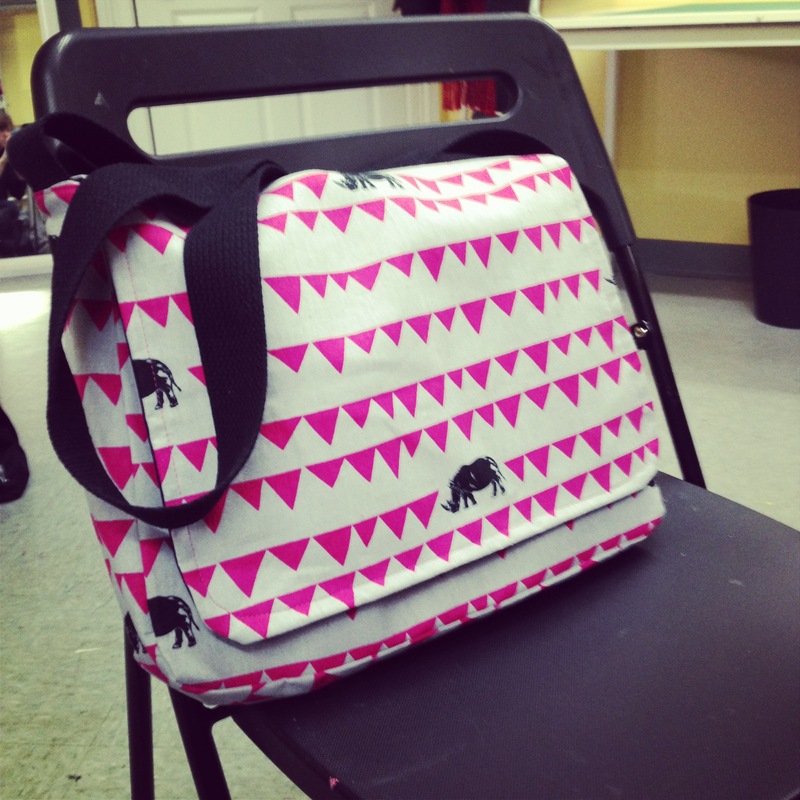 Besides learning to use a sewing machine, I had never taken a sewing class before. My learning method was to study a pattern and make lots of mistakes. But I wanted to branch out a little from quilts to bags, and Melissa‘s class at Rock Paper Scissors was just the way to experience a class from a student’s perspective and to get over my fear of interfacing and three dimensional objects. 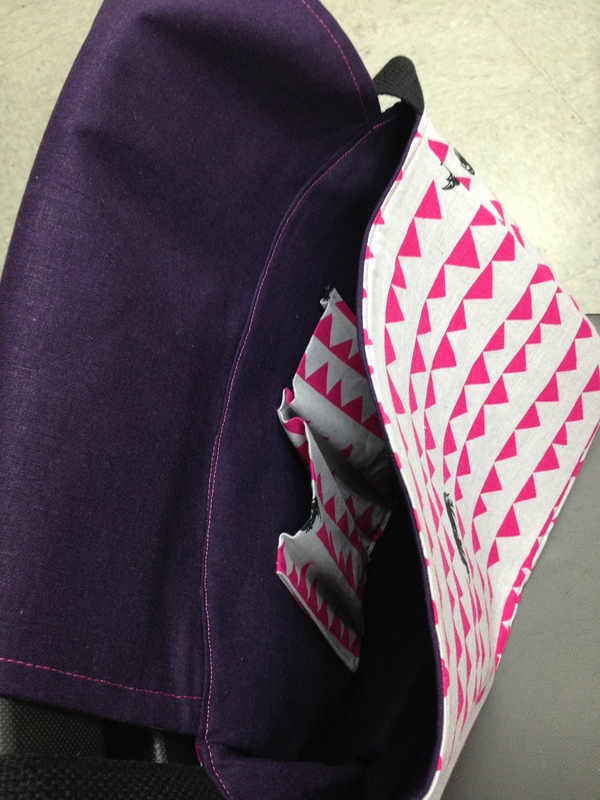 It has a deep purple lining and a gusseted pocket. And I went with hot pink thread. I think it’s Gutterman Dusty Rose, but this rose is hardly dusty. It perfectly fits my guild binder AND my MacBook. I love this bag. I will make more, I’m sure. Both from this pattern and others. I’ve been wanting to tackle Elizabeth Hartman’s Sewing Circle Tote for awhile. 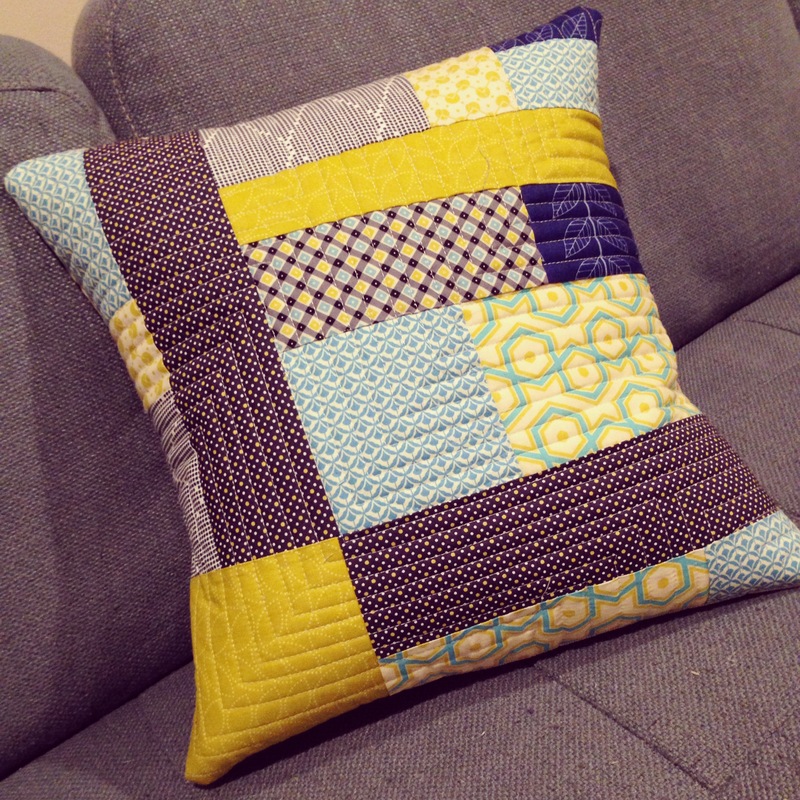 Next up is a companion pillow for Eli’s, which also uses scraps from my Kitchen Window quilt. I’m really proud of how this came out and how quickly it came together. The bottom left corner makes me really happy. Last but not least is the body pillow (for my sister’s birthday, which was two weeks ago). It was my first real improvised piece, and I learned a lot. I learned that I love this size for quilting, and I learned that I need to improvise a lot more. I also need to cut myself some slack sometimes. I hope you have a finish in your future. These definitely helped make my week a little bit better. That’s a really nice bag! I hope my friend Melissa gets around to writing the pattern. It is nice and not too hard to make. Hi Kate! I’m so sorry that I’m only just getting to replying to comments now. I’m going to have to pass. In the next week I have my younger son’s birthday and Thanksgiving to host, so I won’t have much time to spend on the blog. Thank you for thinking of me! Love them all! Yay for finishes!!!! Nice job!! I especially like the bag. Hi Mel, I love the pillow! 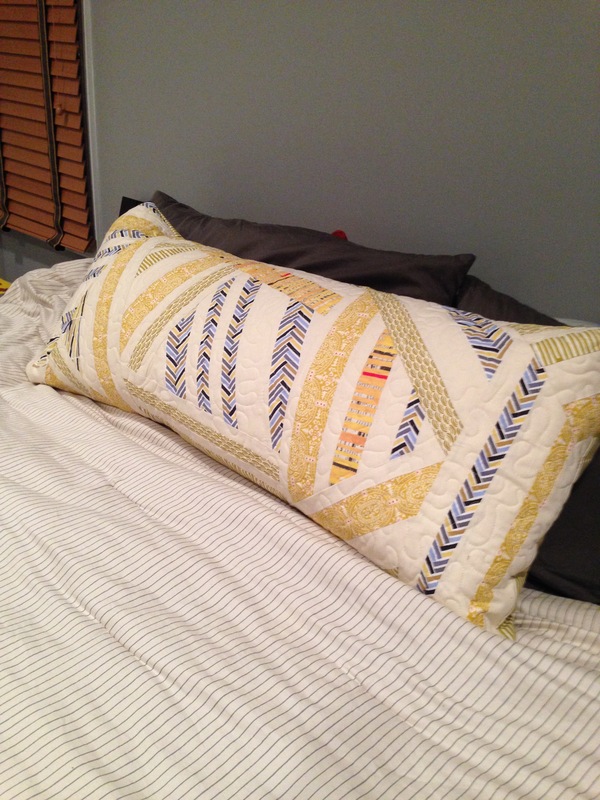 Question, is the pillow quilted on the back also, and is it a pillow cover that can be taken off to wash or is it closed all around? I would love to make those for my daughters beds! Hi Kari! I just did an envelope closure on the back by hemming and overlapping two pieces of fabric. It’s pretty quick and easy. Let me know if you have any questions. The square pillow — YUM! Great job!